Bullfinches are my favorite birds. I created this beautiful winter forest landscape with bullfinches, perched on snowy branches of rowan tree in memory of my walks in a snow-covered forest in Russia. I remember a fabulous feeling of surprise and delight when I unexpectedly spied the bright scarlet chests of the bullfinches, high in the branches of the trees; what a true winter mood they created at that moment. 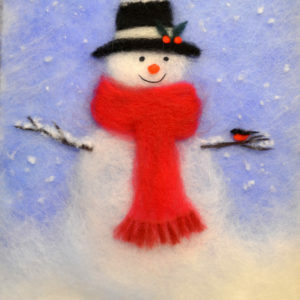 I don’t know why, but when I see these little birds my heart is filled with joy and I understand: “Here it is: real winter has arrived!” This delightful wool painting would be a beautiful addition to your home, and also will make a great gift for anyone that loves birds, nature or the winter season.